Notre Dame Cathedral's spire collapses in fire, but firefighters salvage building's main towers. The Paris police announced late on Monday night that the fire at the Notre Dame Cathedral was under control. One firefighter was seriously injured in the fire that broke out Monday evening. Paris Mayor Anne Hidalgo said on Monday night that firefighters were optimistic that they could salvage the cathedral’s iconic main towers. Speaking outside the cathedral, fire chief Jean-Claude Gallet had told reporters he was “not sure we are capable of stopping the spreading” to Notre Dame’s second tower and belfry, but he later said they had indeed been successful in stopping it from spreading to the northern belfry of the 850-year-old building. French President Emmanuel Macron said the "worst has been avoided" in the fire and added, “We will rebuild Notre Dame”. He also said he would launch an international fundraising campaign for the restoration of the cathedral. 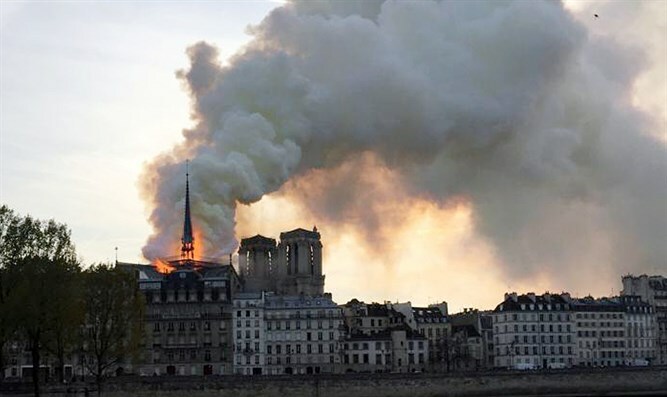 The cause of the blaze was not known, but The Associated Press quoted the Paris fire brigade as saying the fire is “potentially linked” to a 6 million-euro renovation project on the church’s spire and its 250 tons of lead. Prosecutors have opened an investigation into the cause of the fire. Acting Foreign Minister Yisrael Katz said on Monday evening, "On behalf of the State of Israel, I would like to express my deepest solidarity with France and the French nation over the terrible fire at Notre Dame, a world symbol of civilization." Foreign Ministry Spokesman Emmanuel Nahshon wrote in French about the fire at Notre Dame Cathedral on Twitter. "Les mots manquent pour décrire le sentiment de choc et de consternation. Notre plus profonde solidarité avec les Français et particulièrement les Parisiens."